Today’s artificial turf is so close to the real thing that it can be included in any creative DIY project (Note: try to not end your sentence with “of”). Since its inception in the 1960s, artificial turf maintenance appeals to the modern designer and homeowner. Advances -in the manufacture as well as the variety of styles and colors make synthetic turf realistic in texture and appearance. These new products are finding their way into the hands of creative types who are doing all sorts of fun things with it. Watersavers Turf has a few ideas you can try to express your personality, and we have over 60 styles to help you complete your faux grass project. Grow a Green Wall – Like Eichler, who brought the outdoors in with his innovative home designs, you can blur the lines of indoor and outdoor living with an artificial turf wall. Easier than wallpaper to install, you can staple or nail it over plaster or drywall to create a one-of-a-kind look that will last for just the season or for years to come. Create a “Live” Table Runner – Spring is here, and why not create a festive mood in the dining room or on your patio with a faux grass table runner. What a fantastic conversation starter for your guests. All you need is a utility knife to cut it to the right length and width for your table. It’s perfect for hiding Easter eggs and chocolate bunnies. Customize your Stools – Perfect for the man cave or an outdoor bar; turf-covered stools make a fun statement. Just cover the cushions with a piece of turf, add some padding and staple in place as you would fabric. What a great way to enjoy an evening outdoors sipping a fruity umbrella drink or sharing the latest microbrew with friends over a game. Al Fresco Dining – Take an old picnic table and cover it with turf to liven up your next BBQ. 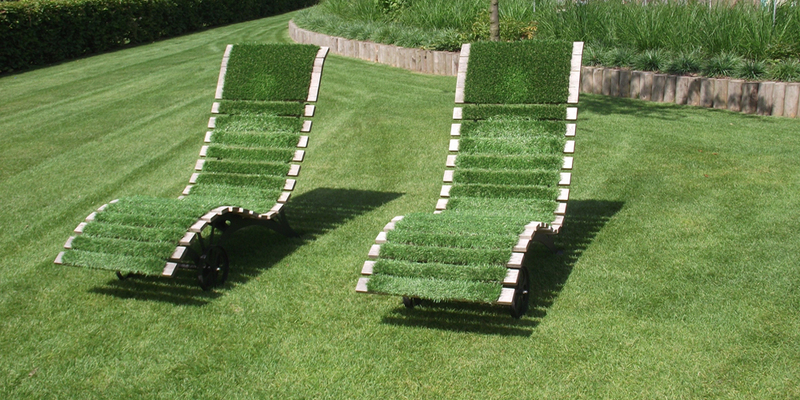 Create a turf ottoman to add to your outdoor furniture set. You can bring new life to old pieces of outdoor furniture that -have seen better days. All you need is some turf, a utility knife and some staples for this project. Decorate with Green – Everyone loves throw pillows, and why not kick it up a notch by covering them with fake grass? They’re great for a patio, porch, deck, or even inside the house if you are daring. Cut a couple of squares of turf the same size, insert pillow material between them and sew the edges. Field of Dreams – Use as a floor covering in a game room, you could paint white lines to make it look like a football field. This would certainly put your guests in the mood when watching the game or when playing a little foosball. Artificial turf maintenance is a snap, spilled drinks and snacks clean up easily with a vacuum. Artificial grass is a great way to express your creativity. Think outside of the box, and contact Watersavers Turf for free samples or for more information on your next synthetic turf installation 844- 974-8873.